Members are active in conferences, webinars, events, trainings, and more. NNPHI is committed to building communities dedicated to advancing public health practice and improving population health. We create spaces and platforms for aligning multiple organizations on policy, systems, and environmental change. 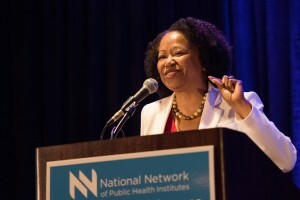 Our convenings, webinars, and annual conference offer collective and interactive learning experiences for professionals within and beyond the public health field. We have hosted more than 50 national meetings and trainings with national partners, including the Robert Wood Johnson Foundation, the Centers for Disease Control, Centers for Medicare and Medicaid Services, Health Impact Project, the Association of State and Territorial Health Officials, and the deBeaumont Foundation. Sign up for news about public health practice, population health improvement, and excellence in public health training. Keep up with our growing network of institutes and training centers.